At Springwater Homes of Florida, Inc. we're in the business of making dreams come true! Your dreams of new homeownership. We realize that making the choice to build is one of the biggest decisions that many people will ever make. And while exciting, it can be a process that is filled with uncertainty. Our mission is to make building your home the most pleasant experiences possible. We take the time to get to know our customers as they get to know us. In this exchange of information the perfect climate is maintained for the creation of an extraordinary home. We strive to always maintain the quality of workmanship that has given us the recognition as one of the top custom homebuilders in East Central Florida. Our builders, Dennis Jarvis and Jim Clevenger, have a combined work experience in the building industry of nearly four decades. 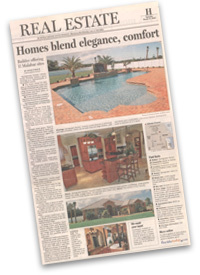 Through the years, many quality-crafted Springwater Homes of Florida, Inc. homes have come to being. We have an excellent reputation within the community we serve for homebuilding excellence. It is a reputation that we have built, literally, one home at a time. We proudly say that our homes are award-winning as we won the 2003 first place award in the Parade of Homes as well as an award for our exceptional craftsmanship. These awards are gratifying because we think they highlight our abilities as judged by a “jury of peers”. Even more exciting is the word-of-mouth advertising we get repeatedly from our legions of satisfied homebuyers, an even more trustworthy judgment of our abilities. We want to give each homebuyer the best product and service of which we are capable. From the initial design through the finished product, our goal is to satisfy their every dream for their new home. At Springwater Homes of Florida, Inc. our promise to you is that not only will we listen to you, we will use that information to create the home of your dreams, more affordably than you ever thought possible. Please view our Image Gallery to see examples of our work. Not only do we specialize in new home construction, but we also can help with back yard remodeling and home renovations.